On Wednesday, March 20, 2013, we invite you to join us as we gather to mark the tenth anniversary of the tragic U.S. war on Iraq. This unprovoked war of aggression led to the loss of many hundreds of thousands—perhaps more than a million—lives. Many more were wounded physically and psychologically. While the Iraqis bore the brunt of the losses, thousands of U.S. troops also perished, tens of thousands were physically wounded and hundreds of thousands traumatized by the horrors of war. Many here and in Iraq suffer greatly to this day. 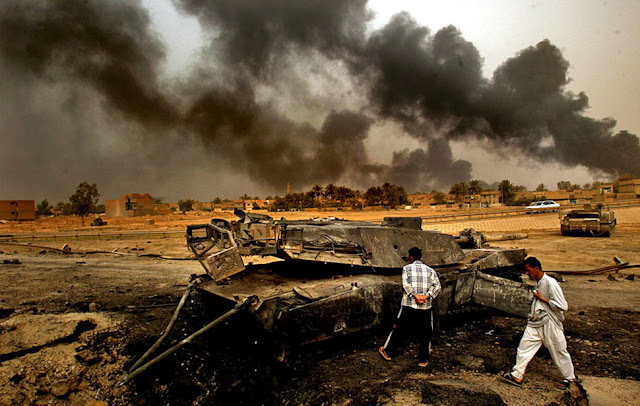 The war also led directly to the dislocation of more than five million Iraqis, forced from their homes, and made refugees in their own, or other countries. The war brought with it the destruction of infrastructure and serious environmental pollution. It also entailed overall economic costs to the U.S. of more than four trillion dollars. The perpetrators who initiated this criminal endeavor still walk free. While launching an aggressive war against a nation that had taken no hostile action is clearly the highest form of war crime under the Nuremberg Principles, the U.S. holds itself above international law. Our government consistently refuses to allow bodies like the International Criminal Court to have jurisdiction over American officials like Bush, Cheney, Rumsfeld, Powell, Rice, etc. The Iraq War and related military spending contributed to the near doubling of U.S. military spending over the last decade. And, even though U.S. forces, aside from contractors, have been withdrawn, the Pentagon budget remains at an elevated level, with no plan to return to the pre-war military budget levels. Peaceworks encourages you to join us in marking this sad anniversary with a call for peace and reconciliation, as well as revaluation. It is time for the American people and our government to recognize the need to change our role in the world. Rather than continuing in the role of dominating superpower with a permanent war economy, we need to transform the United States into a peaceful, cooperative nation. It’s high time we redirect the funds and human talents currently directed into warfare into making our nation and the planet peaceful, prosperous and sustainable. Please join us on Wednesday, March 20. We will hold an expanded Rush Hour Peace Demonstration at Broadway & Providence beginning at 4:30. Participants are encouraged to arrive any time they can between 4:30 and 5:20. We will then assemble for a short Peace Procession to the war monuments in front of the Boone County Courthouse where we will have a short program. The program will feature two speakers: Zaid Mahir, an Iraqi author and scholar who was in his native country at the time of the war, and now lives here in CoMo, and John Betz, Vietnam War combat veteran and president of Veterans for Peace. There will also be time for silent reflection. Facebook Event: Facebook users take note. You can RSVP that you're attending and also invite others to participate if you CLICK HERE.